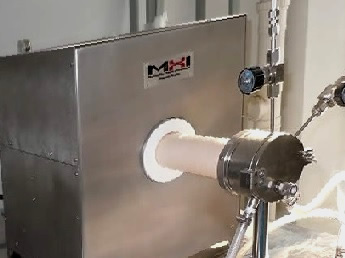 MHI high temperature furnaces incorporate industry tested control systems. Tube furnaces find use where an accurate temperature or temperature gradient is required with an atmosphere. Tube furnace applications. Several models are listed below. Typical options that are routinely quoted are the gas management systems (SIMGAS), oxygen and other gas sensors, vacuum and vacuum measurement systems. MHI's single and multi-zone tube furnaces are available in temperatures up to 1760°C for all applications where process heat is required. 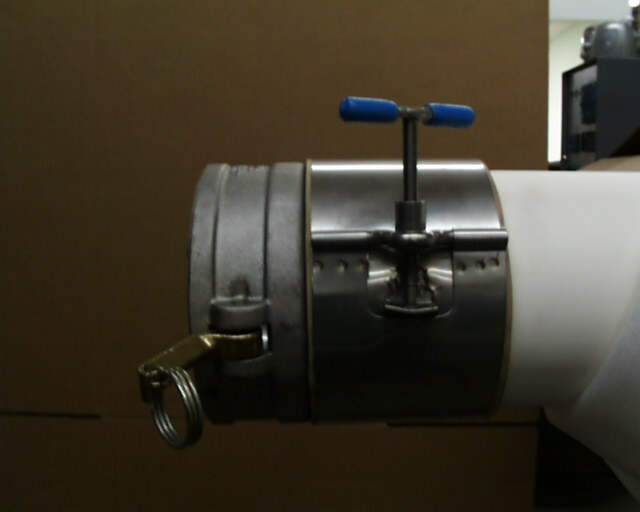 Standard dimensions for single phase heated tube zone of 2.5" x 12" three zone high uniformity are 27". Several laboratory and industrial models available with quick disconnects. Long uniform zone. A typical configuration is shown on the right with multiple gas inlets. Available also are customized end-caps or quick-disconnects (snap screw or buckle snap). Everything is listed in the quote for choosing options including a low price data acquisition and process download option. How uniform are the MHI tube furnaces? A testimonial from the Stanford HUTF facilities. See also uniformity page. 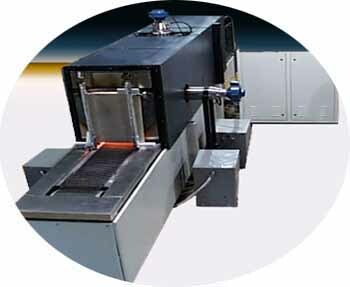 "The high-uniformity tube furnace facility provides the ideal environment for quantitative measurements of absorption spectra and spectral parameters (line strength, line-broadening coefficients,and more). It is also provides controlled conditions for sensor validations". 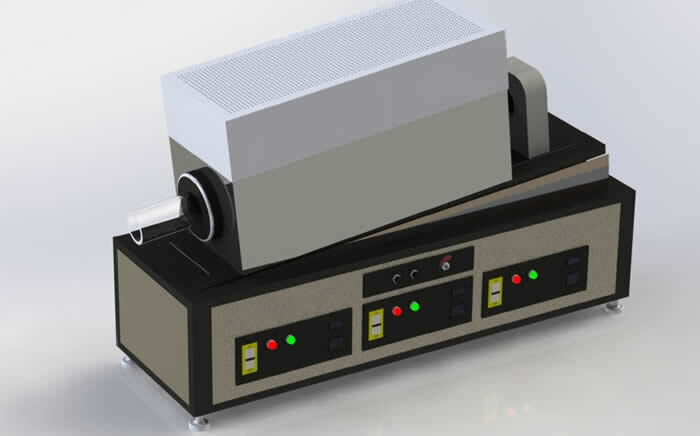 Models with continuous operating temperatures of up to 1760°C, maximum operating temperatures of 1800°C. Fully programmable control panels allow for high accuracy and control of processes or applications. Small footprint. MHI tube furnaces can fit on top of a workbench. End caps allow accurate temperature and atmosphere control. Vacuum depends on the temperature and type of process tube chosen 10^-5 torr. Compatible with MHI-DACS Software for data logging and process programming. 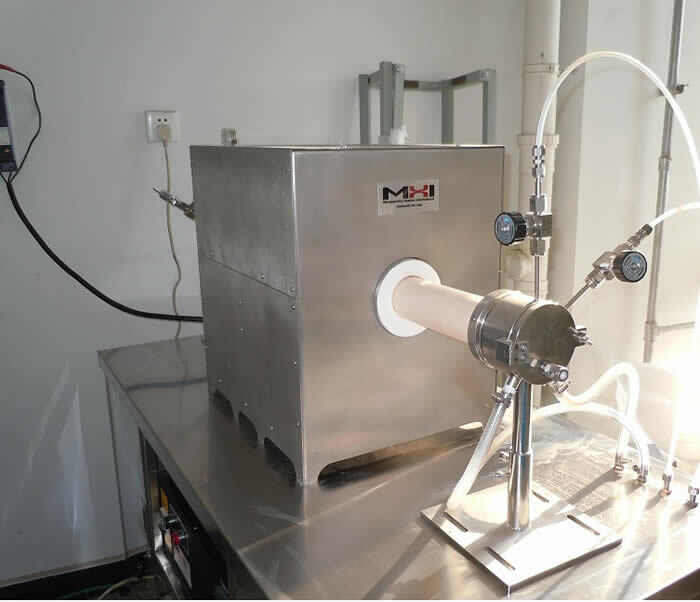 SIMGAS gas mixing system allows for precise mixtures at moderate flow rates. Quick disconnect end caps allows for easier configuration changes. 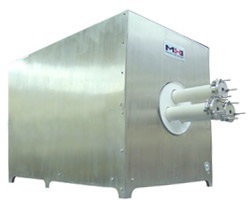 All MHI tube furnaces feature rugged stainless steel construction, electronic controls capabilities and MHI's highly acclaimed heating elements. Our tube furnaces feature continuous operating temperatures of up to 1760°C. Variable up up to 4"D x 16-17" L.
Please specify in request. Standard diameters 2.5" or 4". 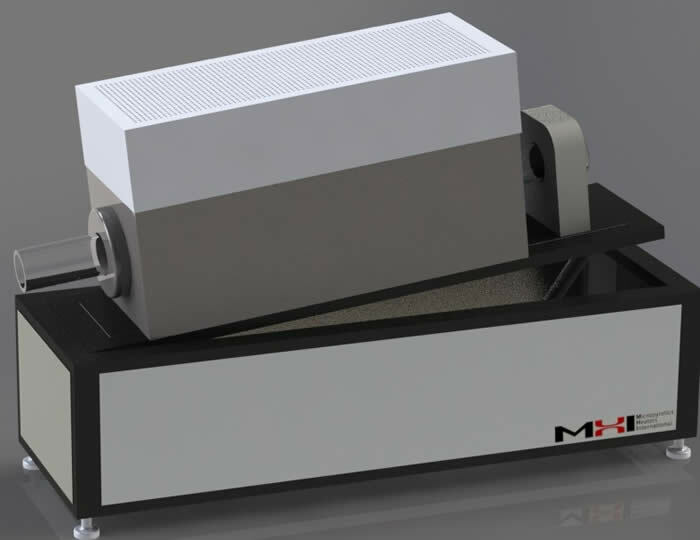 Because of their versatility, MHI's furnaces allow for a number of uses. Because each application is unique, Please Contact MHI to discuss which product best fits your needs. Tube Furnace Common Uses. 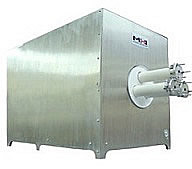 MHI offers full gas management systems. Palladium refining to dross separation techniques for aluminum. For Palladium and Platinum Production. Recycle from dross/cake sponge. Attach to steam generator (end caps required). Attach to gas input (end caps required). Use SIMGAS. Drying, Brazing, Vacuum and Inert. Save substantially. Contact MHI for a per load ROI estimator and methods to do quick loads. Melting Sintering, Oxidation, Pervoskites. Add OAB steam. Gas Preheating, Hydrogen Gas Heating. Annealing, Coloring, Heat treatment. Materials Testing, Creep, Fatigue, High Temperature Wear. Lubrication. Metallurgy. Use for palladium refining to dross separation techniques for aluminum. General Heat Treatment. Custom Applications. Industrial Processes for Syngas, Biomass, Biogas,H2, CO2 for H2 supply, electricity generation, CHP-sawdust, paper waste, switchgrass. Ag-forest residues, Wood chips, Sawdust, Paper Waste, Energy Crops – switchgrass, miscanthus or biomass crops. Start even with 40-55% moisture, process gasify cellulose, hemicelluloses and lignins. MHI offers three control options with our tube furnaces: Electronic control panels with overtemperature controls, MHI DACS as an electronic controls program and SIMGAS4 as a gas management system. The combination of these controls makes MHI tube furnaces highly robust and scalable. 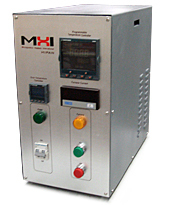 Many of MHI's electronic furnace controllers feature multiple voltage inputs, overtemperature controls, programmable cycles and a number of other features. For more information about MHI's control panels, Contact Us or See More Information. MHI Tube Furnaces are compatible with MHI DACS for furnace controls, step programming, data logging and more. DACS also allows for remote furnace control, allowing one central location to control multiple devices. Gas Management Systems in tube furnaces serve the materials and electronic community when processing has to be carried out in vacuum or gas atmospheres. You can expect excellent temperature uniformity with MHI tube furnaces. We can also provide you with a complete custom gas control panel, with gas lines and controls. Please check options of quotes. 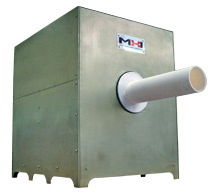 MHI's single zone tube furnaces are available in temperatures up to 1760°C. Standard dimensions for the heated area are 2.5" x 12". 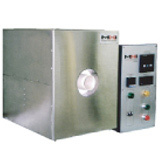 Single zone furnaces are highly uniform. 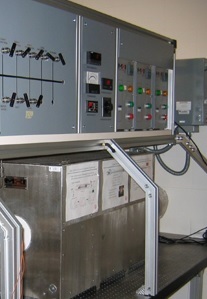 Three Zone Tube Furnaces include HIPAN controllers with Master/Slave option. Each controller is equipped with an independent over-temperature control. Three zone furnaces feature temperatures up to 1760°C and heated tube lengths of 27". 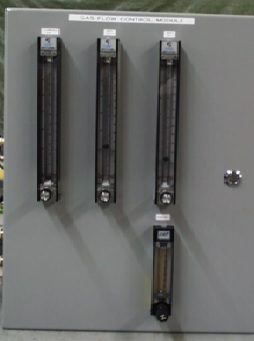 Multi-zone furnaces feature high uniformity due to their design and the use of multiple BPAN/XPAN controllers.